Goal: Teach your teen to master angle and perpendicular parking. Location: Start in large, level, mostly empty areas. You will need both angled and perpendicular spaces. The gentler turn makes this the easiest type of parking for new drivers. Hint: Choosing a parking spot on the left side of the car can provide more room to maneuver and a better view of traffic when backing out. Turn when the front of your vehicle reaches the edge of the space. Stay alert for cars backing out to leave their space. Signal to indicate intent to turn into a parking space. Move forward until the steering wheel is aligned with the first pavement line marking the space. Look at the middle of the parking space and turn the wheel sharply at a slow, controlled speed. Steer toward the center of the space, straightening the wheel upon entry. Stop when the front bumper is six inches from the curb or from the end of the space. After you’ve parked, put the gear in park for automatic transmissions (for manual transmissions, put the car either in first or reverse) and set the parking brake. Shut off the ignition and remove the key. Check for traffic prior to getting out. Lock the doors. Opening vehicle doors poses a very serious threat to bicyclists. When opening a vehicle door, drivers and passengers are encouraged to check their rear-view mirror, check their side-view mirror, then open the door with their far hand. For more information see page 39. Turn when your outside mirror reaches the edge of the space. Always finish with your wheels straight and your car centered in the space. The steps are the same as angle parking, but the sharper turn into perpendicular spaces may require more practice. With a foot on the brake, shift into reverse, which will signal that you will be backing up. Turn around to look for oncoming traffic. For angled spaces, back up straight until the driver’s seat is even with the bumper of the next vehicle on the turning side. For perpendicular spaces, back up straight until the windshield is aligned with the bumper of the next vehicle. Quickly turn the wheel in the direction that the rear of the car needs to go. Glance forward to make sure the front bumper is clear of the car on the other side. When the front bumper clears the other vehicle, stop, shift into drive, and pull forward to complete the exit. Plan to spend a good amount of time on parking practice with your teen — it’s a difficult skill to learn. Many crashes happen in parking lots, and mastering parking skills is an important way to help avoid collisions. Have your teen practice angle and perpendicular parking 15–20 times each. Goal: Teach your teen to master parallel parking. Location: A street with marked parallel parking spaces at a time of day when traffic is light. Parallel parking is a difficult maneuver for new drivers, so patience is key. Many drivers never learn to do it well, especially in areas where it’s not common. Because of the difficulty of learning parallel parking, and because there are several different teaching methods, this skill is sometimes best taught by a professional driving instructor. Assess your own parallel parking skills and your teen’s abilities before beginning. Start by practicing with cones before graduating to practicing alongside vehicles. Select an available space on the passenger’s side of the car. Signal when approaching the space and check mirrors for traffic behind the vehicle. 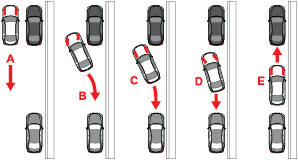 Move forward past the space until lined up directly parallel to the car parked in front, 2–5 feet away. Being too close or too far away will make parking more difficult. With a foot on the brake, shift to reverse and turn around to check for traffic and make sure the travel path is clear. Release the brake, start backing up slowly, and start to make an “S” turn, turning first right and then left. Glance both forward and backward repeatedly to check the space around the car while turning. Once the rear of the car is mostly in the space, start turning in the other direction to straighten out. Adjust the vehicle’s position as needed to center it in the space. Check to see if the wheels are 6–12 inches from the curb. If not, pull out and try again. Always check for passing vehicles and cyclists before you open your door. With a foot on the brake, shift to reverse, turn around, and back as close as possible to the vehicle behind you. Check for traffic, signal, and shift into drive. Make sure the travel path is clear, then move slowly forward while steering rapidly out of the space. If there is no curb, have your teen point the wheel so that the car would roll away from traffic if it moved. When practicing parallel parking, your teen will probably hit the curb several times. Tell them not to worry – even the best parallel parkers do this often. Coach them to pull out of the space and try again, adjusting their turning angle as needed.